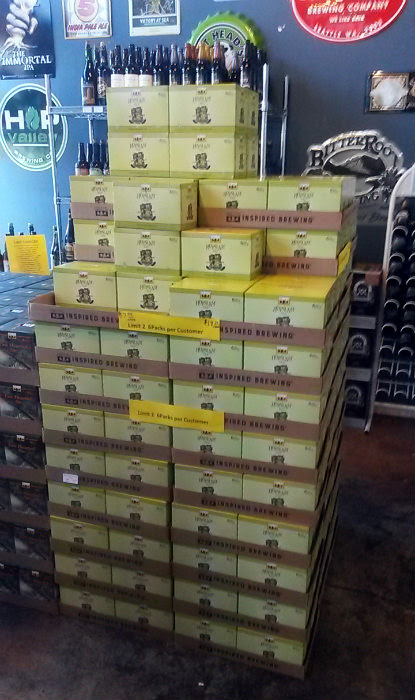 It's that time of year again where certain beers will migrate their way to the Pacific Northwest. 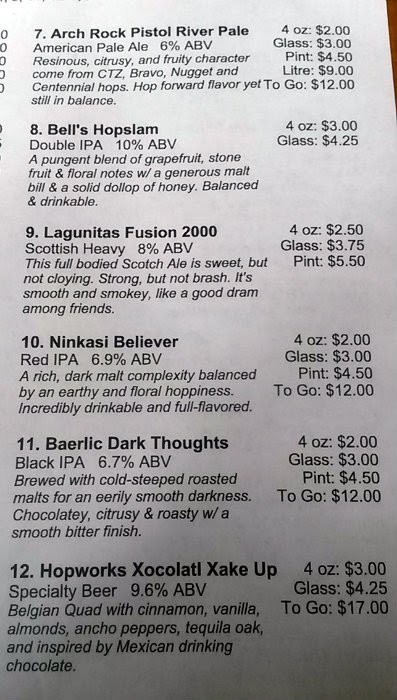 And of course, the more potent Triple IPAs will start appearing more on taplists throughout the next couple months. Late last month, Bell's Brewery shipped its latest haul to Portland, which included many cases of Two Hearted Ale and its highly coveted Hopslam Double IPA. 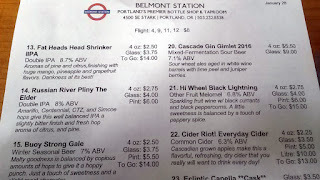 Last year, Hopslam was limited to one per person, and you had to enjoy it at Belmont Station. 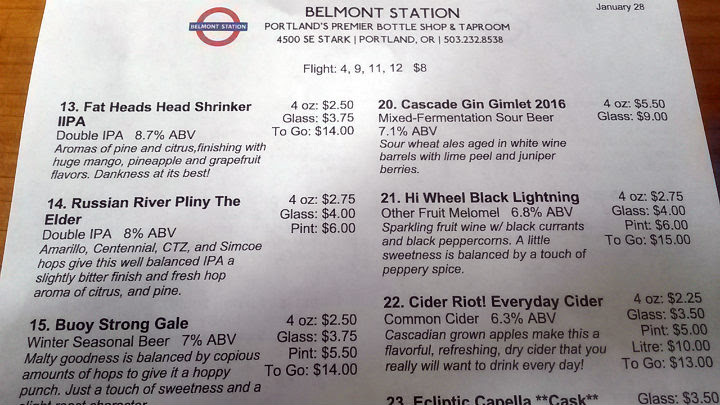 This year, Belmont Station (and Saraveza, among other spots) got a lot more, but the shops still placed a limit on how many 6-packs you could take. 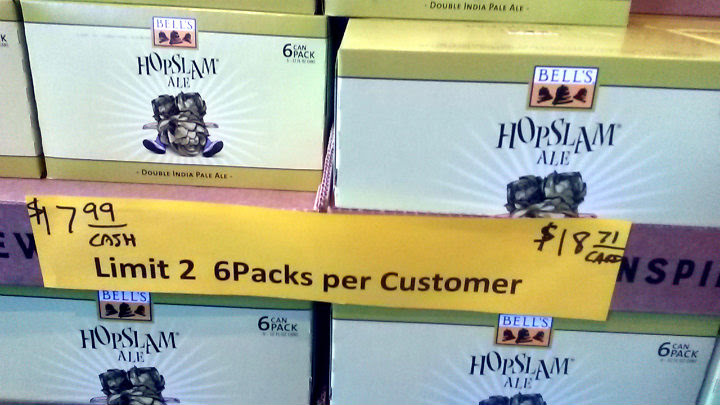 Heck, at Belmont, it was $17.99 for one 6-pack -- limit of two. Being the greedy panda I am, I naturally took two 6-packs and my wallet hated me. 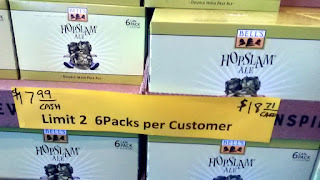 When I returned to Belmont a few days later, the Hopslam cans were obviously gone. Took a day and a half to sell out. 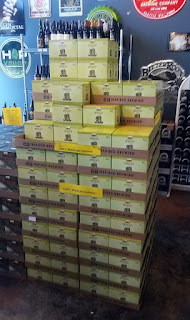 Less than five cases of Two Hearted remained, but I found out it was their second shipment. The original order also sold out within a couple days. Two Hearted Ale had also been placed on draft, the keg kicking a few days before my visit. 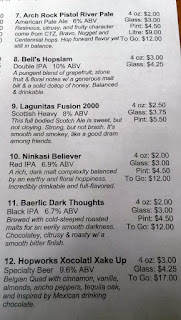 However, Hopslam remained on draft at the bar area. With Block 15 Sticky Hands. And Russian River's Pliny the Elder. Considering Hopslam is only seen in January and February, I knew a side-by-side taste test was in order; otherwise I'd have to wait until next year. I ordered a taster of five different IPAs. It was $13.25, but the panda regrets nothing. BLOCK 15 STICKY HANDS: 8.1% ABV. Dank, slight malt, and lovely tropical. Seemingly drank easier on draft vs. drinking it out of the can. Slight hazy look. It remains one of my go-to beers. 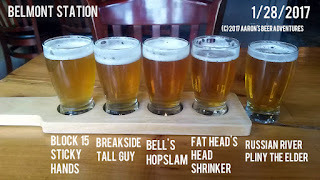 BREAKSIDE TALL GUY IPA: 6.4% ABV. Very tropical. Papaya on the nose, and the citrus really came alive on the tongue during the aftertaste. Lighter and refreshing than the other beers I had. Very drinkable and dangerous. BELL'S HOPSLAM: 10% ABV. A more balanced and floral IPA. This is definitely cut from a different cloth.than its West Coast counterparts. Malty and with octane, sweetness from the honey. Still a great beer a year after I first had it. FAT HEAD'S HEAD SHRINKER DOUBLE IPA: 8.7% ABV. Characteristics include creamy, malty, dank, floral, pine, and some stone fruit (mango). Akin to a New England-style IPA, the bitterness is kept in check, being more tropical juicy. It drinks far easier than its stated ABV. RUSSIAN RIVER PLINY THE ELDER: 8% ABV. 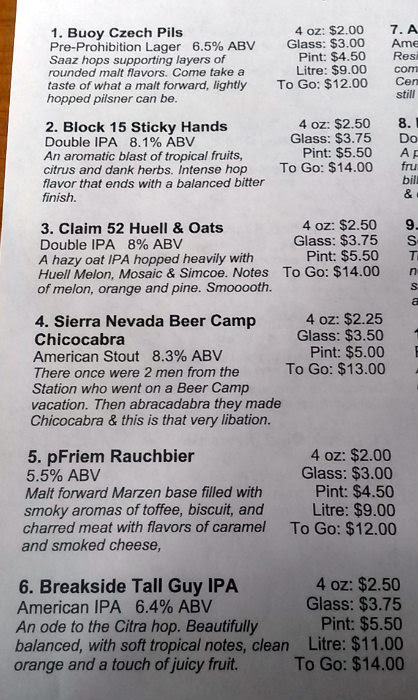 Pliny remains the gold standard of hop-forward balance. Citrus and pine on the nose and on flavor. Citrus is wonderful through the finish. Straightforward, clean, and tasty. Whether you get this on draft or in the bottle, you really can't go wrong. 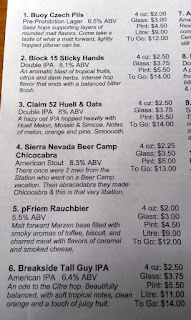 On this day, my personal favorites were Sticky Hands and Pliny. For me, I love the tropical hoppy nature, without becoming too bitter or too malty. Even Tall Guy is a great beer if you're seeking something with a lower ABV and a lot more tropical punch. Of course, this is all my personal preference. 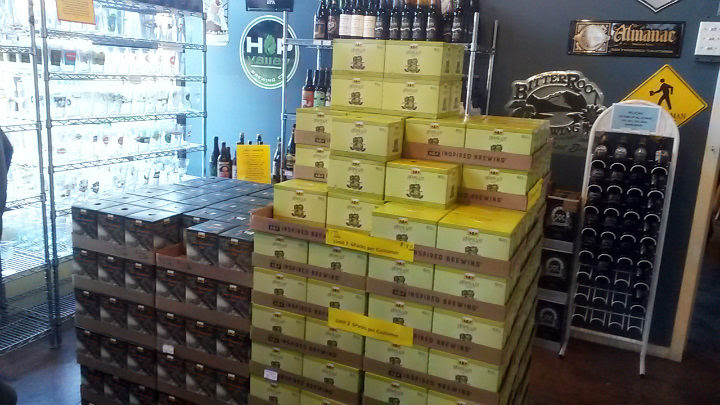 Hopslam was an extremely popular choice during its short time in Portland. Many people after me ordered a glass of it. And who knows, maybe someone saved a keg of Hopslam to tap later this year (even though the preferred shelf life on this puppy is six months). Otherwise, you'll have to wait until next year. Five solid IPAs, side by side. Which one would be your favorite? Let me know down in the comments!